I’m not trying to toot my own horn here, but I’m pretty sure that I’m everyone’s favourite road trip buddy. And it’s not because I don’t complain when it’s my turn to drive or that I don’t need to stop every 30 minutes to go pee. Nuh uh. This one’s way bigger than that. It’s because I bring all the good snacks. I don’t know about you guys, but I can’t get through a road trip without some serious snacks. I mean, I can, but it’s not overly pleasant — not for me and definitely not for anyone who’s unfortunate enough to find themselves stuck in a car with me for any extended period of time. So, in the interest of everyone involved, I never head out for a long trip without a big ol’ sack packed with snacks. I call it The Feed Bag, and not only is it great at keeping the hangry at bay, but it has the magical ability to make time go by faster as well… I mean, I’m normally pretty good about keeping myself entertained on long trips, but if it’s a drive that I’ve done over 100 times and could probably do with my eyes closed [as is the case when I head up to the mountains]? Then I definitely appreciate a little edible entertainment. And I like to bring food from home rather than rely on picking it up along the way because… uhhhh… how do I say this? Mine is better. Toot, toot. Sorry. I think I got a little big-headed after this batch of chocolate fudge banana oat bars that I made rocked everyone’s socks off this weekend. 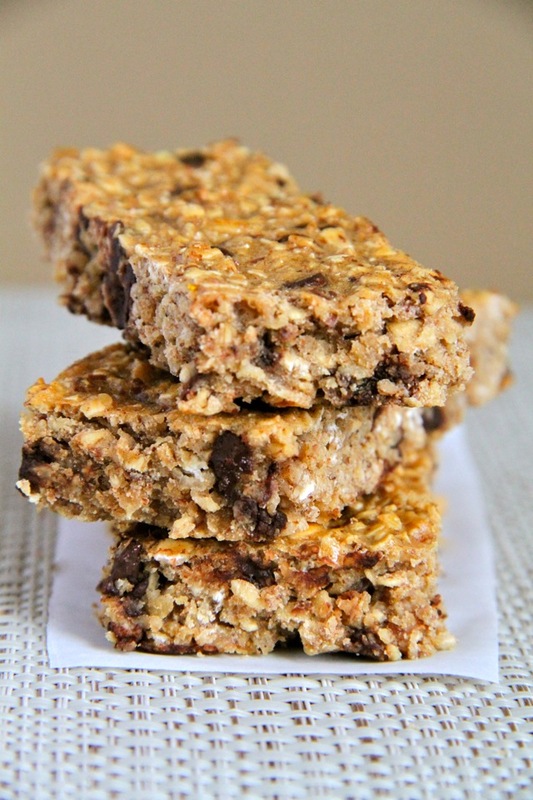 It’s always a little tricky to make healthier snacks for people who might not necessarily eat so healthy most of the time, which is why I was stoked when my bars got a “holy sh*t these are good” review from everyone. And I totally agree. In fact, I couldn’t have said it better myself ? 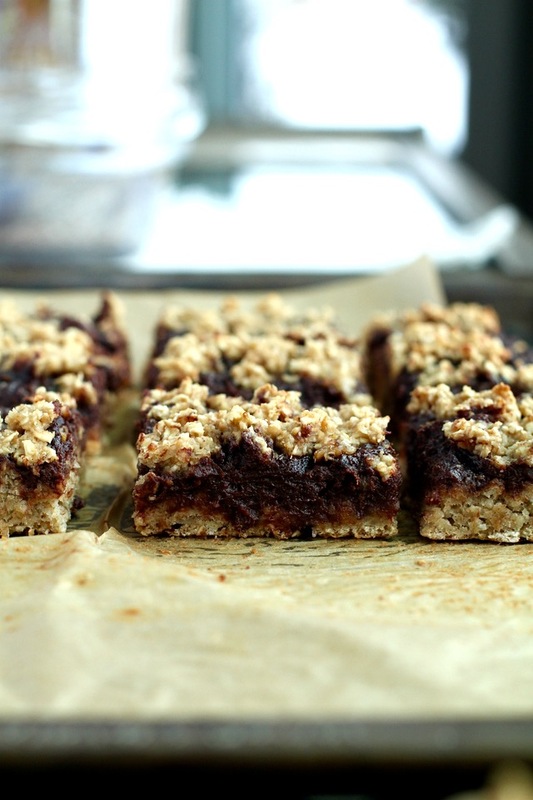 Picture this — a soft-baked banana oat snack bar with an ooey, gooey chocolate [date] filling. It’s perfectly sweet despite being made with NO refined sugar, and perfectly soft and tender despite being made with NO butter or oil. 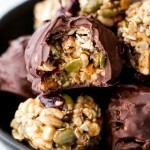 It’s perfectly perfect all around, especially if you’re looking for a tasty energy boosting snack that won’t leave you in a sugar coma 20 minutes later. These were my fuel of choice during this weekend’s boarding sessions, and they did… perfectly ? Preheat oven to 375F and prepare an 8x8 baking dish by lining it with a sheet of aluminum foil or parchment paper, leaving a few inches of overhang on the sides to allow for easy removal. Spray foil with cooking spray and set aside. To make the banana oat base, place 1 cup of oats in a food processor or high speed blender, and process until they resemble a fine flour. Transfer the oat flour to a large mixing bowl, and add the remaining rolled oats, baking powder, and salt, mixing well. Add the mashed bananas, maple syrup, and vanilla extract, and mix until everything is well combined and a dough is formed. Set aside. To make the filling, add the dates, cocoa powder, and water to the now empty food processor or blender, and process until the dates have broken down into a paste. Stop and scrape down the sides of the bowl as needed, and add a splash of water if the mixture is being stubborn. Transfer ⅔ of the mixture into your prepared baking pan, using your fingers or a spatula to ensure that it is pressed down tightly and evenly. Spoon chocolate fudge filling over the surface, and use a spatula or knife to spread it evenly, making sure to only go within ¼ of the edge to prevent burning. Sprinkle remaining oat mixture on top, using a fork to break up bigger chunks and spread it around. Bake for 30 minutes until the top turns a light golden brown. 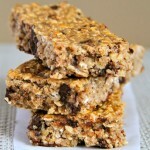 Remove from oven and allow to fully cool in pan before cutting into bars. Store in air-tight container for up to a week. * make sure to use certified GF oats if you need these to be gluten-free. Looking for more warm and cozy breakfast recipes? Try one of these! What are your favourite road trip snacks? I’m leaving for a trip tomorrow morning and while I should be packing I find myself reading blogs… priorities… Now I’m seriously tempted to bring these along for my family to enjoy along the trip! The procrastination struggle is real. I cannot wait to make these later this week!! The doctor has put me on an elimination diet to help heal my gut and to figure out some food sensitivities but this recipe will fit nicely into the plan! Yay! Wow, and the ingredients you used are just so simple and amazing! They look fantastic dear! I love how the fudge is just dates, cocoa, and water! Pinning, these look SO good! So, I’ve recently renewed my love for bananas. And these sound delicious. Plus, I read yesterday that runners should eat a banana every day. These count, right?? I can see why these got rave reviews! I would totally eat these on a road trip. My snacks are much less exciting. Think trail mix picked up at Wawa after realizing I’m starving kind of snacks lol. O.M.G. 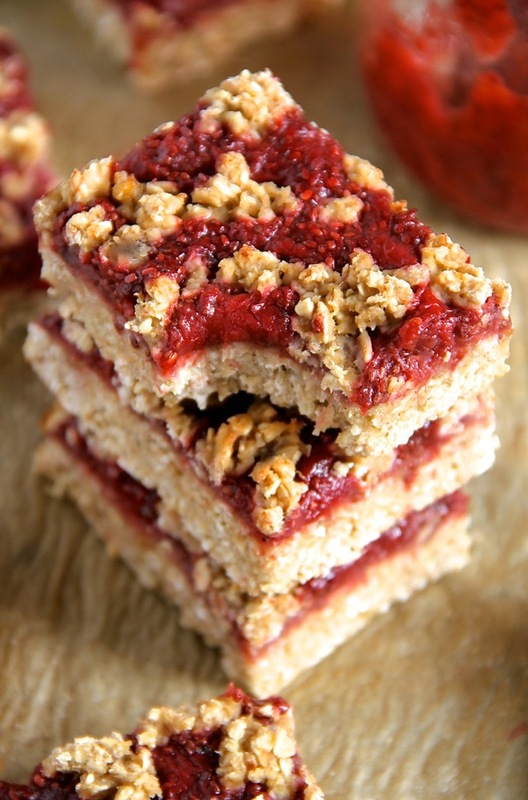 I’m so baking these, right up my alley, easy to prepare and delicious to eat. Haven’t been on a road trip in a very long time but planning to do so next summer. I hope you like them, Lise! Road trips, plane trips, boat trips – ALL require such amazing snacks. And I am also loving the bananas lately, must try these! Sigh…I wish I was experimenting in the kitchen this week – dang you FINALS! These look absolutely amazing and I bet they taste just as good. A perfect winter treat with a big glass of milk yup – that sounds good to me! These look amazing. 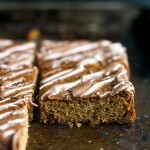 I love how you come up with great ways to use dates as sweeteners in baking. I’ve been meaning to take another road trip down the west coast 😉 Pick you up inn… 2 days. Also, the picture on the recipe card is a smoothie. It’s a delicious looking smoothie, but those ingredients would not produce a smoothie. Just thought I’d let you know! Hope you have a wonderful rest of your day! Eeek! Thanks for letting me know, lovely! Heeeeeeeeeyyyyy – wanna go on a road trip? I’ll do ALL the driving if you bring the snacks! 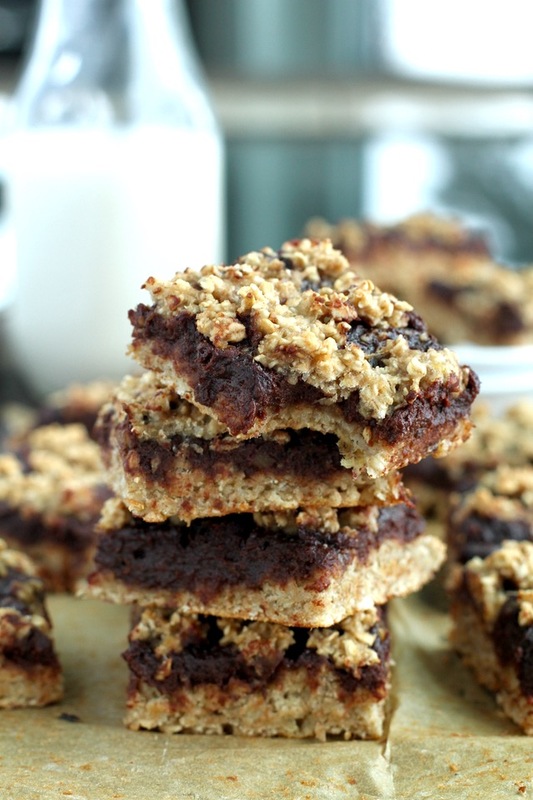 Amanda – these bars look amazing – I’d be happy as a skunk with some of these bars, a loaf of that chocolate banana bread and a huge mug of coffee! The last road trip my daughter and I took was to Macon, GA ( a little more than a couple hours down south from where I am) to visit an old friend and we had flourless cookies to keep us awake – though I’d rather have had these bars! YESSS!!!! This is too funny, because I was thinking back just the other day with fond memories of childhood road trips, and you know what stood out in my mind?? -> the snacks -> the best part of road trips. Figures I’d remember the food as a highlight. But seriously, it really is! And you are 100% right: it did make the time go faster! My favorite was my mom’s homemade snack mix (she had a “healthier one” too, but honestly, we kids just ate that so we could get to the “dessert” snack mix (a combination of pretzels, Famous Amos, Nutter Butters, MnM’s, peanuts, graham cracker pieces, banana chips…maybe raisins? Anyhow, SO good…and if you don’t have those brands in Canada, they are all cookies/candy, lol!). I would *totally* want you as my traveling buddy!! I love pretty much all your snacks/breakfasts/foods! ? Plus, since I think it would be beyond awesome to meet you/be friends with you IRL that I’m like, “We should totally make this happen!” Ah, ohmygosh, I am such an over-eager-creeper-reader, I embarrass myself sometimes! ?? But these bars! I have been so excited for them and now I am definitely adding them to my must-make-SOON list!! And now you’ve flung a craving on me for that childhood snack mix…my brother and I are going to go out today and buy the stuff for it. Add in these bars and we’ve got the makings of a road trip! Just cut into these babies 🙂 I used a longer brownie pan, cut into 21 pieces. Perfect size. So yummy! Incase anyone cares, if you cut into 9 squares = 141 kcal. 16= 80kcal & 21= 60kcal. I added cinnamon to the oats, but that was the only addition. The only hard part for me was spreading the chocolate mixture, but I worked it in & It was worth it! If you’d asked me about road trip snacks a mere two weeks ago I’d have said never without them. Yet when driving up to my grandparents’ for a family gathering I survived a three-hour-trip not getting hungry – a miracle in my life. Granted, I got hangry soon after we’d arrived so it must have been a once-in-a-blue-moon happening. So sign me up for these! I like the idea of using dates because they’re one of the only kinds of dried fruit I really like and would attest candy-like qualities. oh my gosh, need to buy some dates ASAP to make these beauties 🙂 looks delicious!! Um. These look ridiculously amazing. 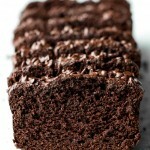 That fudge layer is insane – and so simple! Love it! I find it funny you are surprised when people love what you bake =P Every ingredient you use is delicious on it’s own, so putting it all together would be extra delicious! The last road trip I went on was to Washington DC and I got donuts and scones for the drive. It was a great decision. Wow looks great! I wonder if an avocado would work instead of a banana? I’m not a huge banana fan. I want to make this and crumble it in my greek yogurt! An avocado -might- work, but I imagine you’d also have to add some sugar to help sweeten it up. Another great option would be pumpkin or applesauce! I think that should work just fine, Catie! But you might want to add a bit of sugar to help sweeten it up. I would love to go on a road trip with you girl…especially if these bars are involved ;)! Although I can’t remember the last time I went on a road trip, I am a snack hoarder when I travel- always keep some in my bag just to be safe. 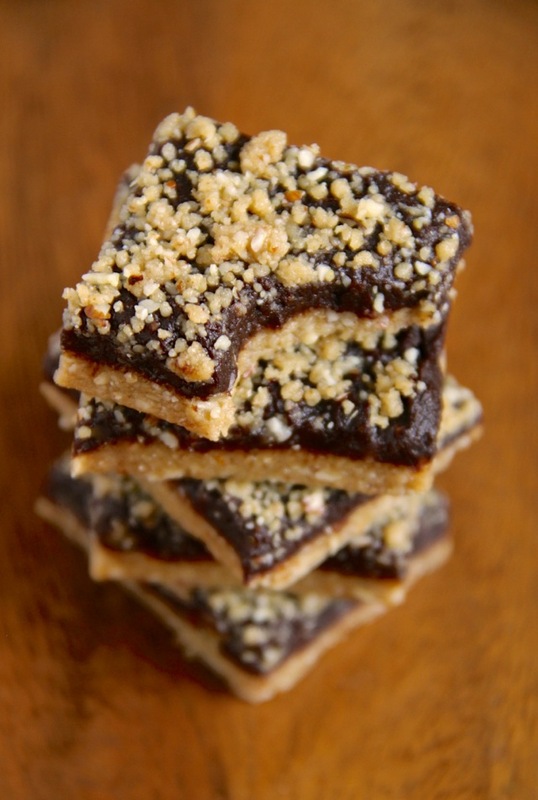 My go-tos as usually almonds, protein bars, peanut butter & crackers…oh and the obligatory dark chocolate! Some day they need to make a way of just pulling food out of the computer screen. Or maybe not, because I would be way too lazy and not actually take on the adventure of making it myself. 🙂 You know how to make the HEALTHIEST treats look so appealing. Apple needs to start working on that kind of technology! Seriously, these look out of this world and I agree with you, they are definitely better than anything you can pick up along the way. Pinned! Hey, I can’t myself that I have to pee every thirty minutes. I’m at a serious disadvantage here. You know I love your bars, especially those blueberry ones because I’m a fruit girl, although I’d definitely be willing to try these. 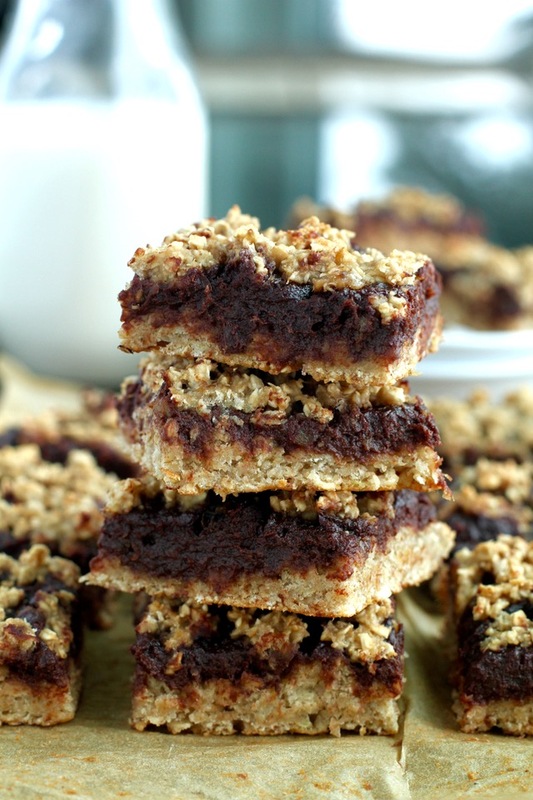 Right after I make your banana bread of course….. this weekend it’s happening!! These are so simple and would easily beat most of those sugary snacks out of the water at a cookie exchange. 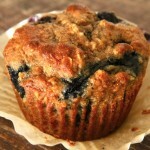 Pinning and totally making when I have bananas that are ripe! !